If you’re looking for at home date night ideas to enjoy with your significant other when going out isn’t an option, we’ve got you covered! When my husband and I first found out I was pregnant with our daughter, I was determined not to become one of those women who completely changes her life just because she’s a mom. I envisioned lunch dates with the girls, regular date nights with my SO, and the occasional weekend getaway, and no matter how much my friends warned me that motherhood would change me, I didn’t believe them. And yet here I am dishing my favorite at home date night ideas, LOL. For the first 2 years of our daughter’s life, we didn’t have any family to lean on for support, and the idea of hiring a stranger to babysit our sweet girl filled me with a ton of anxiety. I’ve since learned to relax and spent a great deal of time working with my daughter to find babysitters she likes and feels comfortable with, but despite our attempts to go out for dinner at least once a month, life with kids is complicated and unpredictable. Babysitters aren’t cheap, and even when everyone’s schedule lines up and you can afford the luxury of a night out, sicknesses have a tendency of happening at the most inconvenient times, resulting in canceled plans and disappointed parents. But that doesn’t mean you can’t still enjoy a date night with your special someone. You just need to learn how to be creative. 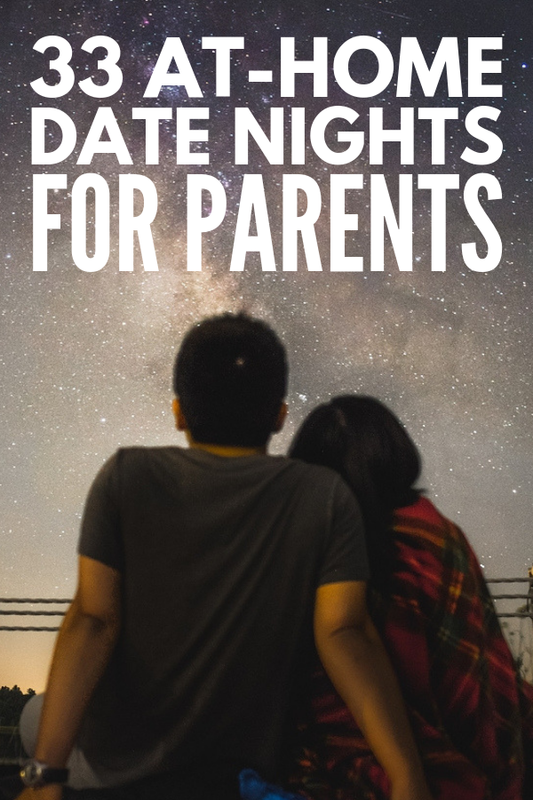 Check out this collection of 33 budget-friendly at home date night ideas that don’t require a babysitter and learn how you can spend quality time with the one you love from the comfort of your own home. Fine dining at home. Cook a delicious meal together, put on your fanciest cocktail attire, light some candles, dim the lights, and transform your living room into your very own restaurant. Chocolate fondue. If you don’t already own a fondue maker, you’re missing out. You can use it with cheese, broth, oil, or chocolate, and it works for intimate date nights at home while also doubling as a good appetizer or dessert option when entertaining. Conversation starters. There are tons of great games you can buy that are centered around providing conversation starters, and Our Moments Couples is a great G-rated option if you’re looking for romantic things to do at home. If you want to kick things up a notch, Talk Flirt Dare is a great one to try! Kissing. Oftentimes we get caught up in the busy-ness of our lives that we don’t take the time to connect with our partners, and while date night often ends in a pretty predictable way (nudge nudge, wink wink! ), a little teasing can be fun. Pull your SO into a deep kiss at the beginning of the evening as a preview of what’s to come! Re-write your wedding vows. Or, if you aren’t married, you can write love letters to one another. Take a bubble bath together. Turn your bathroom into a spa with some tea lights, an aromatherapy diffuser, a bottle of your favorite wine, and some bubble bath. Give each other a massage! The perfect thing to do after a bubble bath is to give each other a massage, and this Kama Sutra Massage Oil set will help take things up a notch. Romantic movie night. While it’s always great to get away from Netflix and do something TOGETHER as a couple on date nights, sometimes curling up on the couch with a Nicholas Sparks movie is just what the doctor ordered. Dancing. While we often pump the tunes and dance like crazy people with our kids, co-workers, or while driving in the car, another idea to consider if you’re looking for romantic things to do at home is to put on some lovey-dovey music and dance together. Yes, it sounds corny, but if you keep an open mind and embrace the silliness of it all, it can be extremely fun while also allowing for closeness and connection. Star gazing. Sit outside on your balcony, back deck, or front porch – or lie on the grass in your backyard – and watch the stars while holding hands. Play board games! We shared 16 of our favorate family board games HERE, but if you’re spending a night in, opt for something a little more…grown up. The adult version of Watch Ya Mouth and What Do You Meme? are good ones, but don’t underestimate how much fun you can have playing something as simple as Scrabble or Backgammon with your SO after a long week. Wine and cheese night. Stock up on some new wines you’ve been dying to try, grab some cheese and crackers, and setup your very own wine tasting in your living room! Make your own sushi. If you and your other half are adventurous with your food, grab a sushi making kit and challenge yourselves to re-create some of your favorite rolls from your local sushi joint. Watch stand-up comedies on Netflix. If you can’t agree on a movie to watch together, or feel too tired to make it through an entire flick, Netflix has a ton of great stand-up comedy specials to choose from by fabulous comedians like Hasan Minhaj, Trevor Noah, Iliza Shlesinger, Sarah Silverman, and Ali Wong. Did someone say ‘potluck’?! If you’re looking for at home date night ideas for married couples who have kids, why not organize a pot luck dinner with some of your closest couple friends? Challenge everyone to bring a prepared dish, a drink, and a game to share to keep things interesting. And if they have kids, you can make it a family affair and allow your little ones to have a slumber party. Create a ‘date night jar’. If you consistently find yourself struggling to come up with fun things to do with your spouse, pour yourselves a glass (or 4) of wine and spend the evening coming up with a jar full of ideas to keep you inspired throughout the year. This way you always have options at your fingertips to keep date nights fresh and fun. Plan a vacation! This is probably one of my FAVORITE date night ideas for married couples, LOL. I’m a firm believer in the idea of always having something to look forward to, even if it’s months and months away, and I love the idea of sitting down and planning out ways to escape the grind. Watch a marathon on TV. Put on your PJs, turn off your computers and smartphones, and spend the evening curled up on the couch watching an entire season of your favorite show together. Play video games. Shortly after my husband and I were married, we bought a Playstation and spent many nights challenging each other in various car racing games. It was so much fun! Whether your kids have a Nintendo Switch or XBox One, check online for some fun games you and your other half can enjoy together after hours. Tackle a home improvement project. One of the things that 11+ years of marriage has taught me is that date nights aren’t always about getting dressed up and going out for a romantic meal, and when you’re juggling kids, a home, and careers, sometimes the perfect at-home date night involves tackling a project together. Whether you’re organizing your garage, painting your bedroom, or staining furniture, you’ll not only spend some good quality time together, but you’ll enjoy a sense of accomplishment when the job is done! Build a fort. If you want to be deliberate with your time together, and are looking for at home date night ideas that force you to find ways to connect and don’t require cooking or DIY-ing, build a fort, pour some wine, and spend time talking like you did when you were first dating. Play a game of Twister! Put your phones and electronics away and enjoy a classic game like Twister! It’s sure to get the entire family laughing and will help you blow off steam and enjoy time with your little ones after a tough week at work. Crank your favorite tunes and get your groove on. We equipped our house with Sonos speakers last year, allowing us to have spur-of-the-moment dance parties whenever we feel like it. It’s a great way to get silly and spend time together, and my little one LOVES creating family playlists for us to enjoy. Organize a karaoke night. If your kids like to sing as much as my daughter, but you’re not interested in purchasing a big ‘ole karaoke machine, I highly recommend this karaoke microphone. It’s bluetooth enabled and has a speaker and smartphone holder, making it the perfect compact (and affordable) karaoke option. Create your own drive-in! Grab your laptop and some pillows and blankets, pop some popcorn, and watch a movie in your car or under the starts in your backyard. Play video games. If your kids have a Playstation, Nintendo Switch, and/or XBox One, challenge each family member to choose their most favorite game to share. Amazon sells a lot of classics that are compatible with new gaming consoles, like Tetris for Nintendo Switch, SEGA Genesis Classics for Playstation 4, and Atari Flashbacks for XBox One, and your kids will likely get a kick out of seeing the games you used to play when you were their age! Do a puzzle together. You can make this an activity you do together every evening before bedtime to help connect with one another and unwind after a busy day, and this jigsaw puzzle roll mat will allow you to store the puzzle safely so it doesn’t take over your dining room table. Create a glow-in-the-dark scavenger hunt. You can make this as simple or complicated as you want, and this set of glow-in-the-dark party supplies will certainly inspire you! Organize a family game night. We shared 16 of our favorate family board games HERE, and our faves are Pop The Pig, Watch Ya Mouth, Stare!, and Scrabble. Make your own ice cream. Whether you use an actual ice cream maker (we love our Cuisinart Ice Cream Maker!) or try a no-churn option on Pinterest, this is sure to be a hit with your little ones! Have a camp out in your living room. Pitch a tent (if you have one), grab some sleeping bags, and tell scary stories and roast marshmallows over the stovetop. Create a family ‘bucket list’. Challenge everyone to come up with 3 things they’d like to do as a family over the next 12 months, write them out on slips of paper, and put them in a jar so you always have inspiration to draw from when boredom strikes. I hope these at home date night ideas inspire you to think outside the box and find fun and creative ways to spend quality time with the ones you love. Remember to keep an open mind and to focus less on WHAT you’re doing, and more on the fact that you are doing something TOGETHER. If you found this collection of at home date night ideas helpful, please share this post on Pinterest!